So here we are – the end of 2015. We have decluttered so much from our lives! We are feeling lighter every day with our attitude changes toward stuff, less commercialization in our daily lives, and simplicity/minimalism. 11,827 items were removed from our house/garage. And to think, we thought the removal of 2015 would be difficult! Our modified goal of 10,000 was reached (thanks in part to our house flooding) and surpassed. Our 6 counting sheets for the 2015 in 2015 Challenge. We were tempted to go on a decluttering spree to fill the last page but decided against it tonight. Party with friends won! 44 donation trips – we averaged one every 8.3 days! It has been so helpful having a donation box by the front door. When it fills, out it goes. We even had the Salvation Army do a pickup of large furniture items. So easy to do! We are afraid with the number of donations that the IRS will audit us! Thankfully we took pictures of every item donated! Documenting the number of items, while difficult, was really eye-opening. Who knew that we had over 400 unworking pens in the pen drawer?? I guess if you have a pen drawer, that should say something! Our closets and drawers open and close without fear of something falling on you! We decided to purchase just one item for each other for Christmas and stick to a $250 budget per person – this was a new concept for us. John asked for a fitbit surge (and it is a small item to have enter the house!) Barb asked for a kindle voyage. She has figured out how to borrow e-books from the library and it is small. Win Win! Now to finish going through the boxes of books in the garage! We have decided to continue the challenge for 2016. As of today, we aren’t sure we will count for the entire year, but who knows. We were really surprised at the number of items in 2015. Thank you Nourishing Minimalism for the push we needed to make this happen! It has been a crazy month for us. The master bath shower is done being tiled and grouted. Walls have been painted. Waiting for the shower doors to arrive! Decluttering the stuff has slowed down this past month. Our focus has been on finishing the master bath shower. We’ve had delays in getting the contractor to do their part on the shower floor. Now that we are both working again, time seems to be our biggest hurdle to getting the house back to normal. There are only a few boxes left in the garage. We have noticed that our time after work during the week is less stressful. Having less stuff makes picking up so much easier! If only we had recognized this when we had small children living here! So now for the numbers! GRAND TOTAL = 10,581 with 38 trips to Goodwill. 1 trip in September! Items removed this month = 71 !! New Goal – 12,000 by the end of the year. The garage is our next focus area! Barb still has boxes of books to go through! 2015 in 2015 update #6 – We made it to 10,000! So here we are – another month of decluttering the stuff completed! We’ve been moved back into the house now for a month. Most of the boxes are empty or stored for the kiddos to go through or pick up. I’m assuming some of it will be here for a while. Good thing we have an extra closet! In unpacking all of our belongs, we decluttered some more stuff – 516 items to be exact! We have basically gone through everything in the house and are feeling pretty good about how it is turning out. Now the garage is a different story! There are many items (mostly furniture, storage containers that are empty, and master bath stuff) we didn’t put back into the house and now we really need to make a decision about that stuff. Good thing we have a 3 day weekend coming up! We’ve been decluttering fools this week! 238 items gone and basically all our boxes unpacked (kiddos still have some to go through but that will take time). As Barb walked into the kitchen this morning she saw something bright on the floor. Drawn to bright things, she had to investigate – even if to just pick it up and throw it away. Now some of you will recognize the company name. How many of you remember T G & Y? How many of you remember the old pre-computer cash registers? Who remembers having to make change – not the register telling you how much to give the customer? Who remembers putting these kind of stickers on every item before it was sold? The memories of our first “real” job! Barb worked for them from 1977 – 1982. She was making $2.20 per hour when she started. Ended making $4.90 per hour. She never shopped there after leaving since all stores in our area were closed. John’s first “real” job was with the county. He worked every Saturday for “a real paycheck” washing and gassing county vehicles. Back then, it was cheaper to hire high school kids than to use an automated car wash. 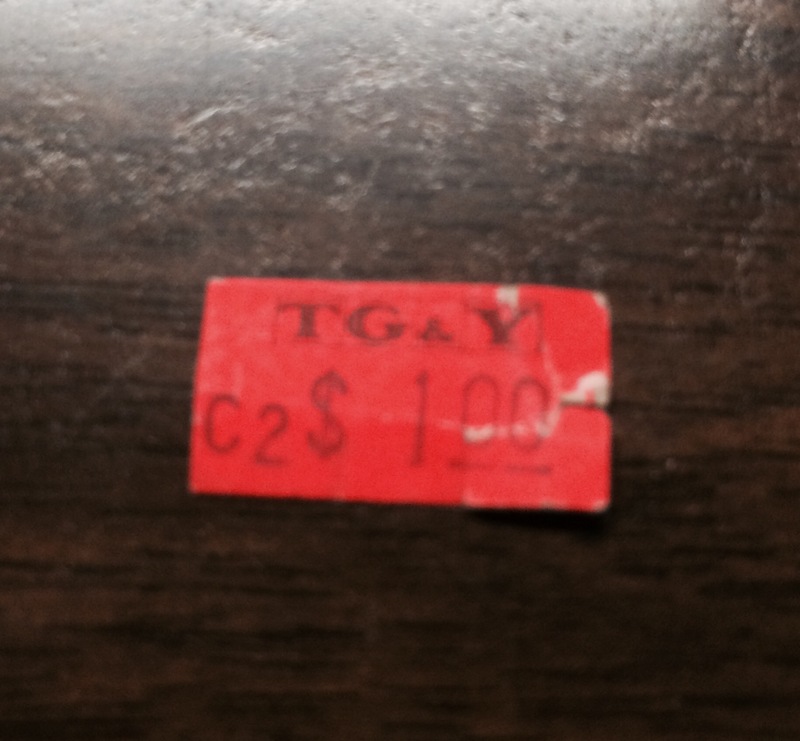 This sticker has been floating around our stuff for over 33 years! It has survived our getting married and moving into 3 different places. It survived our flood. It survived a house with children, dogs, and a cat. What did it fall off of? How did it end up on the kitchen floor? This little sticker is a survivor! If it can make it intact, so can we! We can’t believe how much stuff we have decluttered! After the “Great Flood”, we have been unpacking and decluttering along the way during July. Our stuff was delivered July 14 and we staying the night for the first time July 30. We had to wait for a bathroom to be functional. Things are not quite back to normal but they are coming along. GRAND TOTAL = 9994 with 32 trips to Goodwill. 9 of these trips were this recent month! Items removed this month = 1632 !! WE WILL MAKE IT TO 10,000 ITEMS REMOVED FROM THE HOUSE!! Who knew that we would actually declutter this much stuff when we started in January. We were tempted to go around and find 6 items but we are too tired tonight. We didn’t eliminate any stuff from the garage this month. It is still full of boxes/belongings/furniture that used to be in the house. The Barbie category didn’t change either. The toys left are in the rafters of the garage and can wait until we have more of the house completed. While we are unpacking, we keep thinking how much more work it would have been with 8362 more items. The approximate 1000 books alone gave us a backache! Yesterday was a crazy day. John received a call from a neighbor while at work that water was running out of the side yard, garage, and front door. He works about 30 minutes away so called me at work (I’m about 10 minutes away). Sure enough our house was “leaking”.